In today’s homes, the backyard has truly become an extension of your living space and there’s nothing like dining outside and enjoying the beautiful weather while taking in a pretty view. But cooking outside is even better. Unique Companies have created fabulous outdoor kitchens with outdoor-ready kitchen appliances, including stainless steel grills, sinks, refrigerators, warming drawers, space heaters, pizza ovens and even kitchen cabinets. We’re talking way more than the standard barbecue setup, with a range of amazing appliances and tons of prep space. These spaces would make even professional chefs super jealous. Like your indoor kitchen, make sure that you have sufficient counter spaces for preparation and serving. You will most likely end up doing a reasonable amount of food prep outside, near the grill, and it is never fun having to juggle pans and cutting boards to find an open spot to work. Also, invest some time in ensuring that you have an efficient work triangle (or however you foresee actually using your equipment) — just as you would for your indoor kitchen. It’s no fun having to walk around an island to get from your oven to the refrigerator, just as it isn’t fun having to walk from one end of the outdoor kitchen to another to carry food to the table. Just as the indoor kitchen is a magnet for guests at any party, your outdoor kitchen will become the focal point for your entire property. On a summer evening, everyone will be attracted to the fire and smells coming from cooking outdoors. 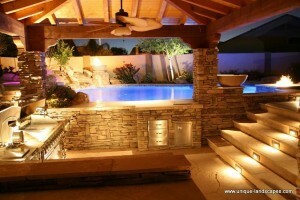 In the winter and cool evenings outdoor kitchen will provide warmth and a feeling a well-being. 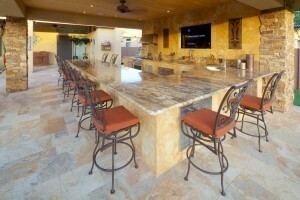 You have to plan on having lots of guests in your outdoor kitchen. Plan for where you want them when you are cooking, where they can sit and watch and where they can just hang out and enjoy the space. Whether you love to entertain family and friends, or just want a personal backyard retreat, we have the knowledge, experience and professional design skills to turn your desires into reality.